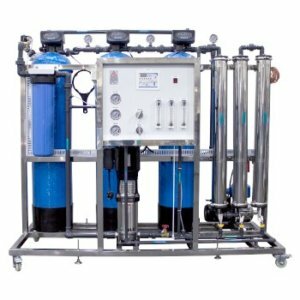 How Reverse Osmosis Systems work? 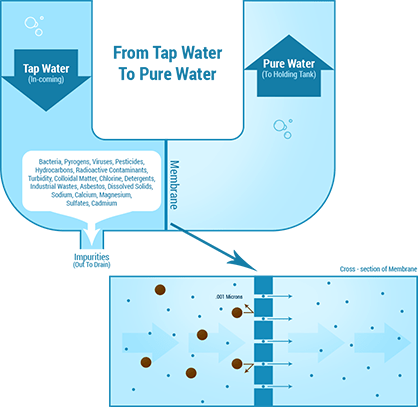 Although Reverse Osmosis systems look complex, it is really a simple and straightforward water filtration process. And it’s not a new process. 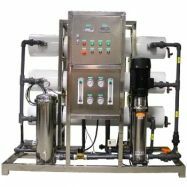 High-pressure (pump driven) reverse osmosis systems have been used for years to desalinate* water – to convert brackish or seawater to drinking water. 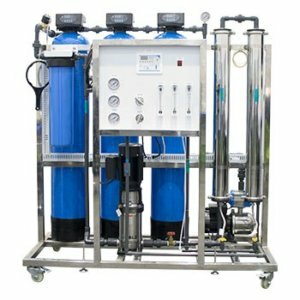 Having a better understanding of how a reverse osmosis system works will eliminate the mystery and confusion you may feel when you look at a reverse osmosis system with its many colored tubes and multitude of filters. 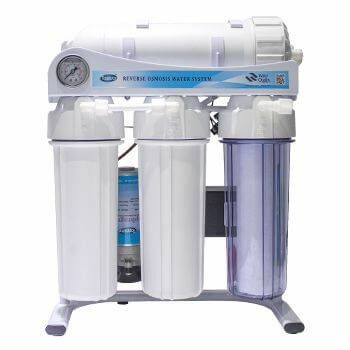 Read on to enhance your knowledge of residential reverse osmosis systems. 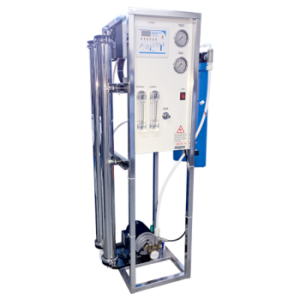 All Reverse Osmosis Systems work the same way. 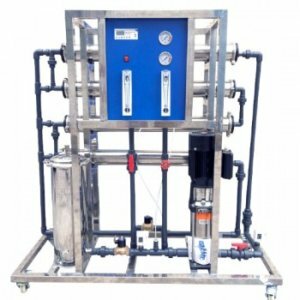 We have RO systems for home use and we have RO systems for industrial use. 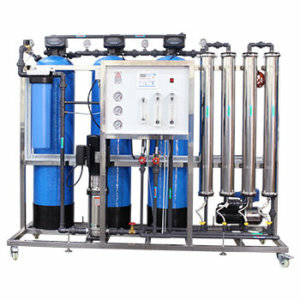 All RO Systems have the same basic components. 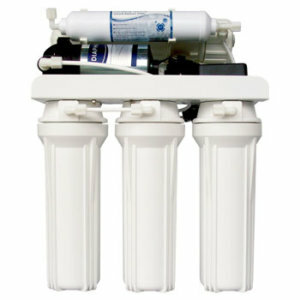 The difference is the quality of the filters and membranes inside the Reverse Osmosis system. 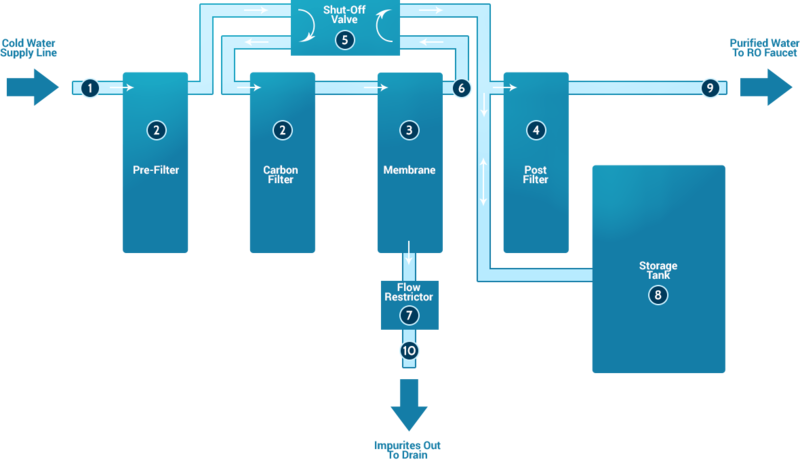 How does a Reverse Osmosis Membrane work? 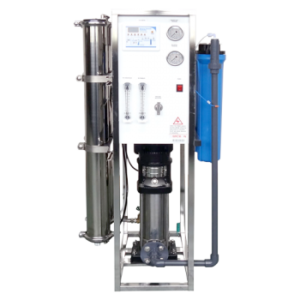 Reverse Osmosis is a process in which dissolved inorganic solids (such as salts) are removed from a solution (such as water). This is accomplished by household water pressure pushing the tap water through a semi permeable membrane. The membrane (which is about as thick as cellophane) allows only the water to pass through, not the impurities or contaminates. These impurities and contaminates are flushed down the drain. Improves taste, odor and appearance. Highly effective purification process. Will remove the pollutants listed below and more! 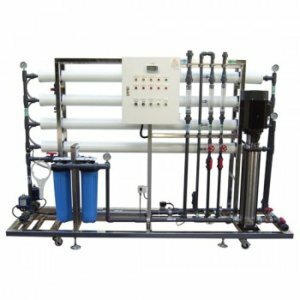 What are the components of Reverse Osmosis System? 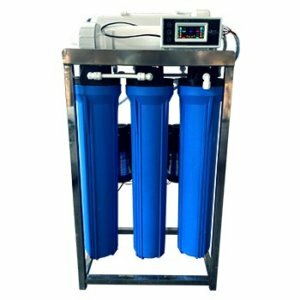 Are all Reverse osmosis systems and filters the same? While one RO System may look just like the next in terms of design and components, the quality of those components can be very different. These differences can have a significant impact on the quality of the water the system produces. Here are some examples of questions you might ask and consequences associated with “less than desirable” quality. Has the manufacturer used sound methods? What types of welds have been used in these plastic products? Will they allow contaminated water to bypass the filtration system? Will they allow the system to leak? How has this filter or membrane been created? Will it allow the water to ‘channel’ and, in effect, bypass the removal component of this device? What about the quality of the ‘fill’? Are its contents of a high enough quality to produce the expected percentage of contaminant reduction? Carbon quality, for instance, can have huge variances in reduction capability, reduction capacity, and the sloughing of ‘fines’, which can prematurely clog or foul the RO Membrane. What are the manufacturer’s controls on tolerances or variations in specifications? If this component is rated as a 1-micron filter will it truly filter out everything larger than 1 micron or will it only do the job 80% of the time? And, what if it actually filters at a .5-micron rate? That will stop the system from flowing — clogging it and forcing filter replacement? If this is a sediment filter and it fails the excess sediment will clog or foul the RO Membrane. And in general – Are the materials used in this product FDA or NSF (National Safety Foundation) approved? If not, you might question their quality or performance ability. So, it becomes clear that the quality of the components is the key to an optimal functioning RO System. So, it becomes clear that the quality of the components is the key to an optimal functioning RO System. 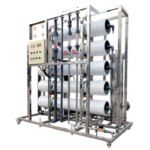 How do you increase the gallon per day (Gpd) capacity of the reverse osmosis membrane ? 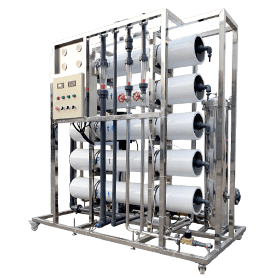 The main reason to change to a higher flow reverse osmosis membrane is to improve the recovery rate which is to reduce the amount of time it takes to refill the storage tank. This insures that there is adequate water available during times of heavy usage or when the reverses osmosis system may feed more than one location such as an ice maker and a dispensing faucet. 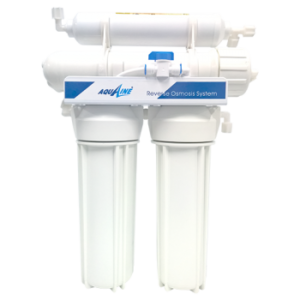 Changing to a higher flow membrane has no effect on the quality of the water your reverse osmosis system makes or the length of time the reverse osmosis membrane will last. The change to a higher capacity membrane is easy. You simply replace your old membrane with a new, higher capacity membrane, along with the correctly sized drain line flow restrictor. (Matching the membrane with the correctly sized drain line flow restrictor is important to ensure the proper product to waste ratio is meet. A mis-matched combination will allow either excess water to flow to the drain or cause premature fouling of the membrane.) 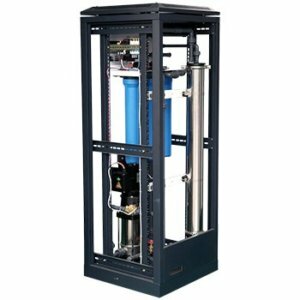 Most standard reverse osmosis membrane housings will accommodate membranes ranging in capacities from 10 – 150 gallons per day. 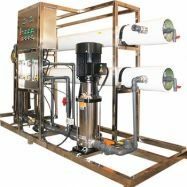 A complete listing of standard residential reverses osmosis membranes and corresponding drain line flow controls is on our membrane page or review the flow control guideline chart for residential reverse osmosis membranes on our parts page. 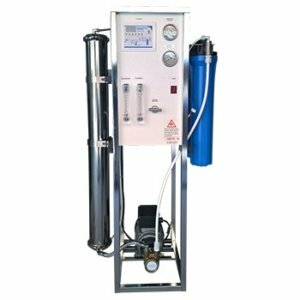 Where can I buy a quality reverse osmosis system or replacement filters and membranes? 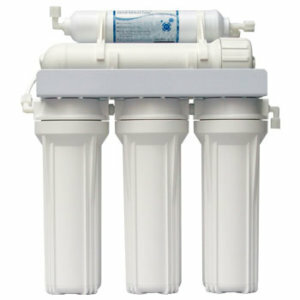 We carry replacement filters and membranes for most major brands of Reverse Osmosis systems. View our list of Reverse Osmosis Filters by brands that we carry. 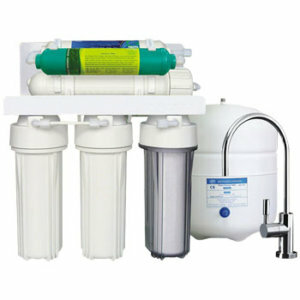 We also have new Reverse Osmosis Systems available to purchase. 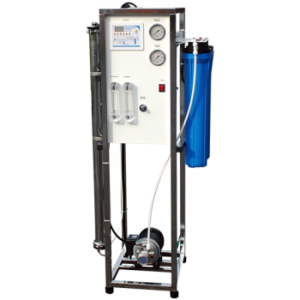 See the features and benefits of each type of Reverse Osmosis System.